Gatland said if Wales won the opening match in France they would go on to to win the Six Nations. “It’s nice when predictions come true, isn’t it?” said Gatland. Wales captain Alun Wyn Jones said that attitude rubbed off on the players. “When you have someone who is so confident at the top of the tree, that filters down and it’s hard to ignore,” said Jones. That record is three Grand Slams – he becomes the first coach to achieve that feat – since Gatland took charge in 2008. It was a 14th successive win for Wales who will now be ranked second in the world behind New Zealand. “There was no doubt I was reasonably emotional afterwards,” said Gatland. “It’s great. I get such a buzz watching those guys lifting the trophy and celebrating. Gatland reflected on his own personal achievement, which he acknowledged was not possible without his squad. “I am pretty proud of what I have achieved,” said Gatland. “I am pretty proud of what this coaching and management team have achieved. It’s pretty special. “I think I will enjoy that afterwards, but the game is always about the players and we stress that. “It was a great performance and the boys thoroughly deserved it. This group of players will run through a brick wall for you. “The younger players have come through with no fear and shown real character. 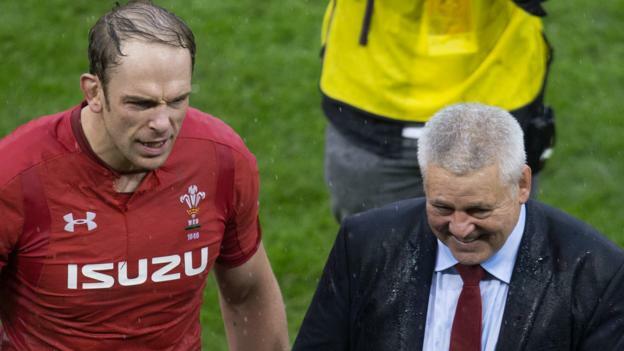 Gatland said Ireland coach Joe Schmidt had made a mistake by opting to have the Principality Stadium roof kept open despite the rain in Cardiff. “We probably got a couple of decisions that went our way and I thought the referee had an outstanding game,” said Gatland. “I don’t think he was too happy about the roof being open and getting wet, so that probably helped us a little bit too! “The conditions suited us in the way we planned and prepared. We expected the roof to be open from the start of the week and looking at the long weather forecast we thought it was going to rain. This was Gatland’s final act as Wales coach in the Six Nations as he steps down after the World Cup in Japan later this year. “I’ll miss the atmosphere of a full house, coming in on the bus, the fans and the celebrations afterwards,” said Gatland. “Sitting somewhere next year watching the Six Nations, it’ll be something I miss. “Having been involved here so long, I just hope they can continue what we’ve done in the last 10 or 12 years in terms of putting some respectability back in that jersey, being successful and being a team that is hard to beat. “I know that when the players put that red jersey on, it’s not always about winning, but the Welsh public want to see this group try hard.